Madina Lake is an alternative rock band from Chicago, Illinois. The group officially formed in 2005 when twin brothers Nathan and Matthew Leone, both former members of The Blank Theory got the money to make their demo from winning Fear Factor twins. The $50,000 was the start up money for Madina Lake. Completing the 4-piece band is Mateo Camargo and Dan Torelli, former members of Chicago rock band Reforma. Their debut album From Them, Through Us, To You was released March 27, 2007 through Roadrunner Records whom the band signed with shortly after releasing their EP entitled The Disappearance of Adalia. Madina Lake themes its music in a town created in the mind of the bass player, Matthew Leone. It is set high in the American mountains, and, isolated from human contact, has remained in a 1950s themed era. The music provides an outlet for the band's views on politics, culture, and the media's obsession with celebrity status. The theme behind the band's music is in relation to the mystery of Adalia. The album artwork shows images of her and the mysteries behind her and the town of Madina Lake. Madina Lake released their second offering and follow up to From Them, Through Us, To You, with Attics To Eden on the 5th May 2009. Filled with a progressed sound and fresh vibe, Attics To Eden certainly delivers on all levels; from the infectious lyrics in the chorus of "Not For This World" to the slower paced memorable "Through This Pain", the band look set to storm the world and add to their ever growing loyal fan base. The band have since been recording their new EP, 'The Dresden Codex', and have released new songs 'They're Coming For Me' and 'Hey Superstar!'. 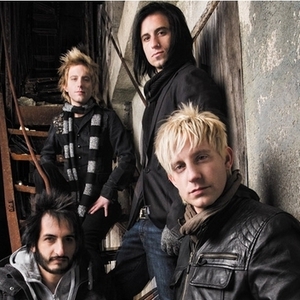 In April 2011, Madina Lake confirmed that they had left Roadrunner records and signed with Sony. The band's third studio album, World War III, was their first on their new label. It was the third and final installment of their concept trilogy, which concludes the Leone brothers' tales of a metaphorical universe and was released on September 13, 2011. (Hey Superstar Songfacts).